This new line is not a charade, nor from all appearances is it smoke in our eyes. 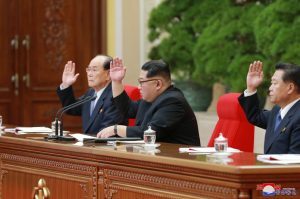 The setting (a Workers’ Party plenum), the presentation, and the substance of Kim’s address all suggest the “victory” of byungjin will likely lead to significant changes in North Korean domestic policy, in some cases loosening the reins, in other cases tightening them up. Kim knows that his father started down a similar path in 2002, but was diverted by a combination of external obstacles, push-back by conservatives, and a wobbly commitment to see the process through. Rather than take half measures at the start, Kim Jong Un has seemingly decided that he will be all in, that the party and bureaucracy will not be allowed to fiddle with the new line, and that laggards will get in step or else. Through a 360-degree approach externally, he seems trying to ensure that problems on any one front can’t drag down the entire enterprise, while progress in one quarter will help support forward movement in the others. This is a gamble, but it is one Kim seems willing to take. The central question from Washington is: will this lead to North Korean denuclearization? From inside the North, however, we have to imagine the question is a different one—will it put the economy on track for long-term improvement and place the DPRK on the map of Northeast Asia as a “normal” country able to share the Peninsula with its richer neighbor to the South while fending off unwelcome pressures from the larger neighbors to the North. In large part, Kim has been putting the foundations in place for this approach ever since taking power in 2012. In particular, he has held to a new economic approach, placing responsibility for decisions—and the resulting benefits or consequences—lower down the chain. He has experimented with new ideas, testing and evaluating what works and what doesn’t. At the Party Congress in May 2016, he laid out long-term goals and policies for the economy that at the time may have seemed far-fetched, but if things break in his favor over the next year, he’ll be able to portray himself as a visionary. It remains important for there to be continued focus on the nuclear issue. But there are other things going on that have a bearing on that issue, even if they don’t actually involve fissile material or rocket motors. In negotiations, the North Koreans operate from a large framework. If we don’t see that, we are liable to miss opportunities for real progress. What we are seeing now from Pyongyang are partial, preliminary, tactical moves. Unless there is more going on behind the scenes yet to be revealed, the North appears to be leaning unusually far forward even before the negotiations start. Whatever the discussions are like out of the public eye, in public, Kim has already given away parts of what would otherwise have been his opening negotiating position. He has ceded ground and not asked anything in return. That obviously won’t last, but for now, we need to recognize that this is not normal North Korean negotiating style. Rather than just a change of tactics, it may be the result of fundamental decisions—e.g. the new strategic line—that portend more change as the process develops.